My Story is Your Story. Read it Here. You are currently browsing the monthly archive for June 2011. After eight years in the financial services industry I believed it was time for a change. I loved working with the youth in my church, so I thought I’d love teaching high school. The teaching part, I didn’t mind so much, but the discipline . . . well, let’s just say I was not up for the job. I was told I was too nice. I had items stolen off my little cart (aka my classroom on wheels because I didn’t have my own classroom). I was threatened. I had to stand between students to ensure that words that were said didn’t follow with blows. I think if you asked my own high school classmates, they would tell you I was of the academic bent–a self-motivated student. So, when I had to teach students that weren’t “self-motivated” I couldn’t identify with them, and I did not know how to handle it–except by prayer. I hurt for some of the kids whose home life made being a good student a challenge. Afraid that the constant stress would cause physical harm to my body, I quit teaching and returned to financial services– back to the very same company I had left–much less stress even with big drops in the stock market. I saw too much at school that caused me grief and it was at that time I decided that my child would not go to public school if at all possible. He was three then. I wanted to homeschool. When he was a toddler, my son and I would sit for hours working in little workbooks. He loved it. So, homeschooling would have been ideal–IF I could have quit work and stayed at home full time. Unfortunately, my husband wasn’t comfortable with losing my salary. So, I opted for the second best choice–A private Christian school. This choice was good for my son. He thrived until he started having seizures in first grade. Fortunately, medication corrected it and he was able to continue in school. After my son completed 8th grade, my family decided to homeschool through an on-line or virtual classroom. So, for the last two years, 9th and 10th grade, my son has been at home–studying. And guess what? He is not self-motivated. Unfortunately, I am not the best at motivating him to work. I’d come home from work too tired to sit with him and go over the areas he struggled in(in case you think I’m a horrible parent, he wasn’t at home alone. My husband was home when he worked different shifts and when he wasn’t there my mother came to stay with him). I think my biggest failure was hoping the on-line school would provide everything he needed to know. I thought working through the internet would be ideal since he loved being on the computer(He has told me that it was probably the biggest hindrance to his learning–too distracted with the internet). About mid-school year, he started complaining that he needed instruction from a teacher. While he is not “self-motivated” he is a very compliant student in the traditional classroom. He has never been a trouble-maker(except when he was having seizures). So, I’m not sure what we’ll do next year. It is something we’ll be praying about. But in the meantime, I’ve completed reading a 180 day devotion book geared specifically to homeschooling parents. 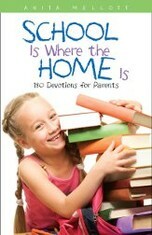 School is Where the Home Is–180 Devotions for Parents by Anita Mellott is filled with spiritual insights that encourage and uplift the parent struggling with all the challenges of homeschooling. I highly recommend it to ALL homeschoolers. I just wish I had access to this devotion book two years ago when I started this homeschooling journey. Note: Today, my son made a 100 on a math quiz. This is a huge breakthrough for him! I’m not the greatest video editor, but I wanted to post some clips from last week’s Worship service. Our Awana students and leaders shared what they learned this past year. 17 Take the helmet of salvation and the sword of the Spirit, which is the word of God. 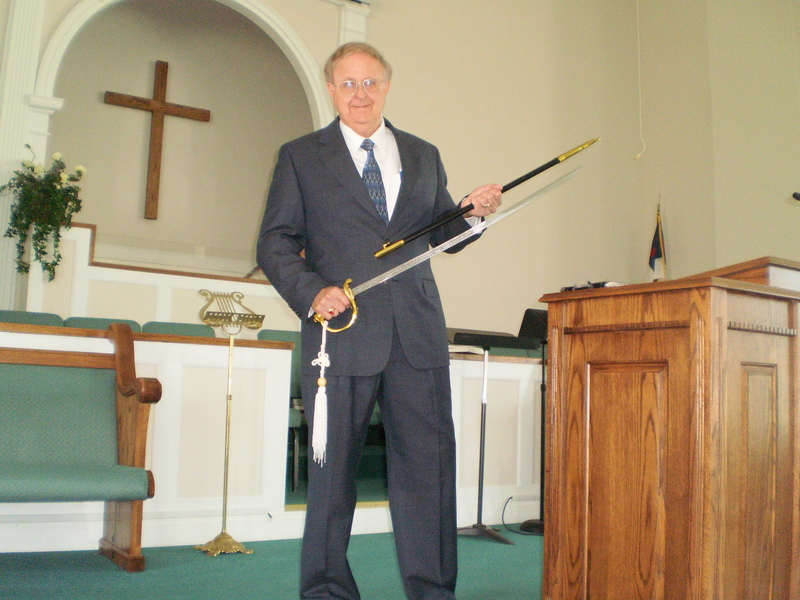 When my Pastor joined the marines, he acquired this sword. He now wields a different weapon. The sword of the Spirit–which is the Word of God. It is evident to me he spends much time in the sWord. 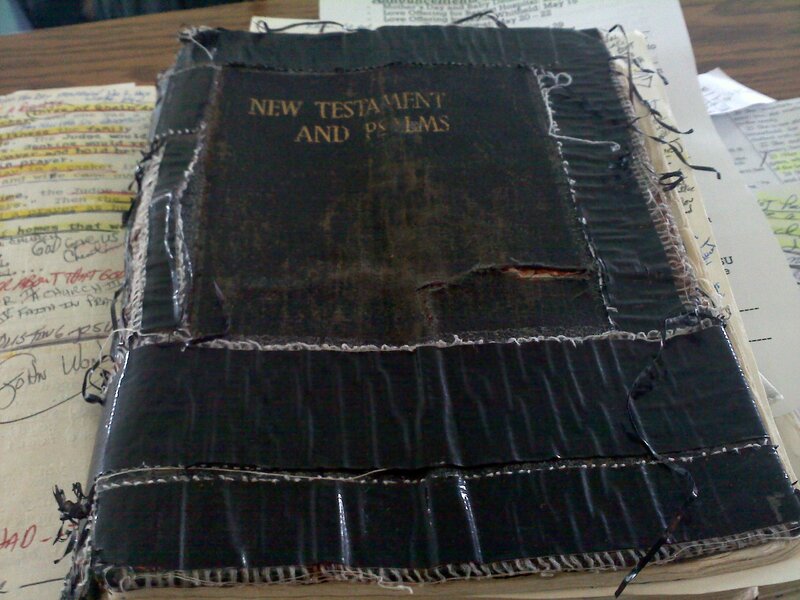 This book has been through many battles. In these videos, notice he has two swords and he never puts down the one in his hand. As a young marine (not yet a Christian) Pastor Barry volunteered twice to be sent to Vietnam. And twice his orders were canceled. Could it be that God had other orders waiting for him in the ministry? Another coincidence? On the day I came prepared to take his picture wielding the word, he preached this message.I did take the picture, but I was in the balcony and it wasn’t clear. I was able to get the pictures of him wielding his sword–the marine one and the God one, a week later. And why did I want to write this blog? I have always been in awe of the scripture this man of God has committed to his memory. 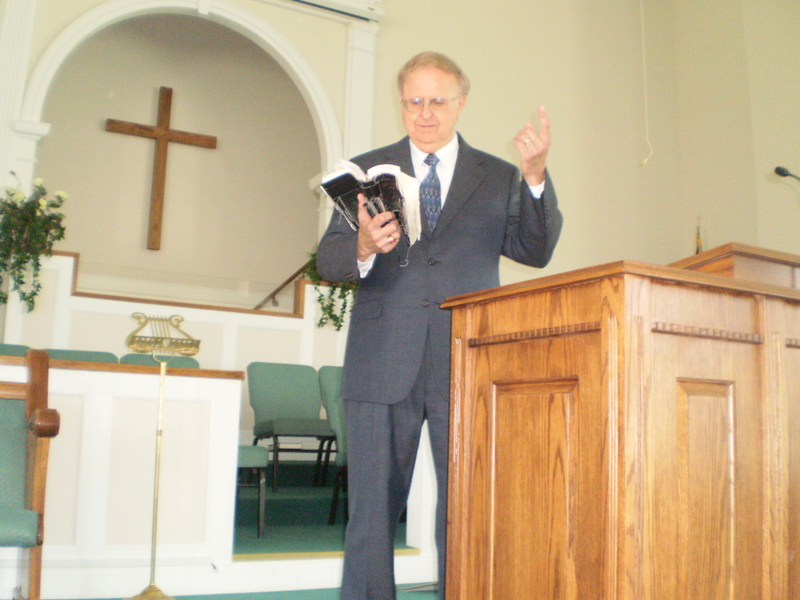 And then I saw the shape of his New Testament he holds as he preaches. And I had to take a picture of it.